Or why not ask us about running an onsite course at your offices? Average score 9.31 out of 10 , based on 8059 reviews8059. If you found this blog useful and you’d like to say thanks you can click here to make a contribution. Thanks for looking at our blogs! 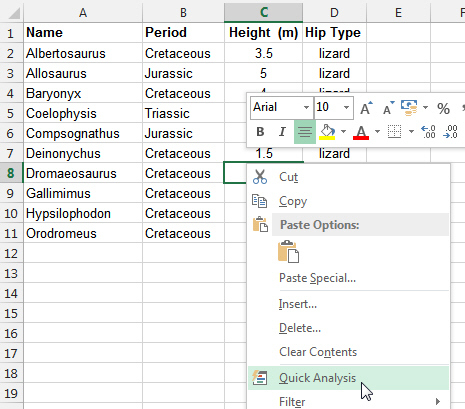 Excel 2013 - the Wise Owl Review! You need a minimum screen resolution of about 700 pixels width to see our blogs. This is because they contain diagrams and tables which would not be viewable easily on a mobile phone or small laptop. Please use a larger tablet, notebook or desktop computer, or change your screen resolution settings. 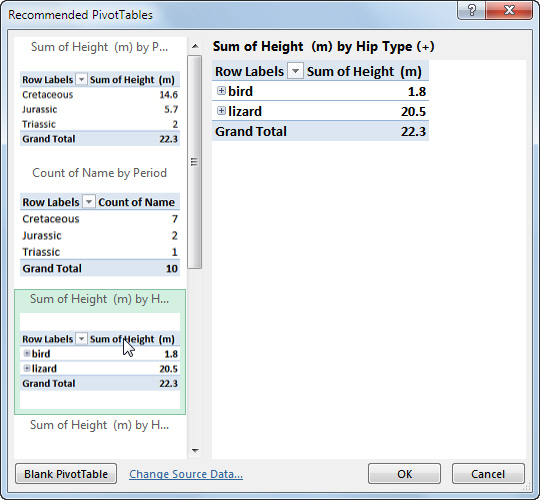 This (long) page lists the main improvements to pivot tables and data analysis in Excel 2013. Let's start with the quick analysis feature. Right-click on a range of data to analyse it. It's hard not to be excited by features like this! As you let your mouse button rest over each option the relevant icons or colours appear on the data. 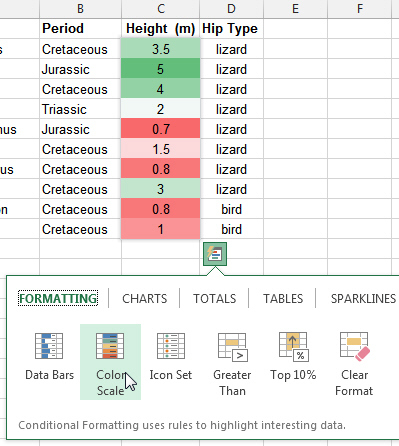 The recommended charts for the dinosaur height data. You can scroll across to the right to choose even more options. Some features of Excel 2013 are hard to distinguish from magic - this is one of them. Each pivot table icon will show a different way of analysing the data. To power-users this feature may not mean much, but for casual users it is seriously impressive! Here we've gone for total height by body type. 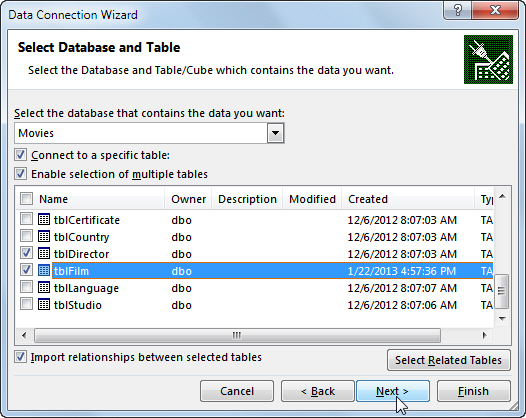 Here I've ticked the Enable selection of multiple tables box - to do just that! You never used to be able to do this! Excel will automatically use any underlying relationships between the data. This feature could change some people's working lives! 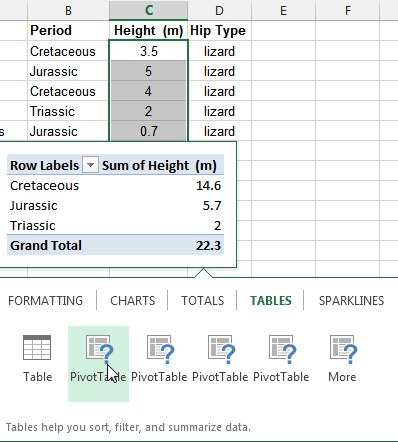 The option to add a timeline to a pivot table. 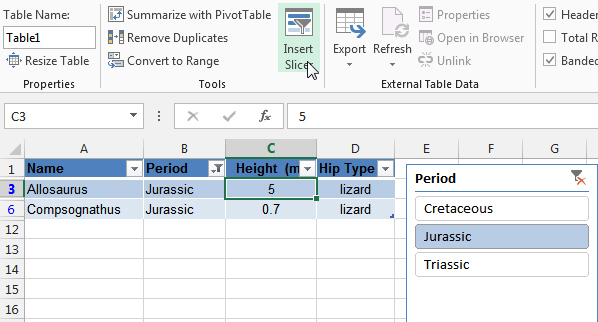 Click and drag on the timeline to extend the time period for the pivot table's data. Here we're using a slicer to show the Jurassic era dinosaurs. 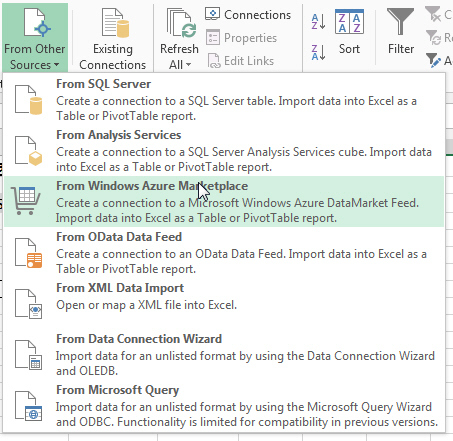 A list of the other data sources now available for use in Excel 2013. Power View If you're using Office Professional Plus, you can use the Power View add-in within Excel. 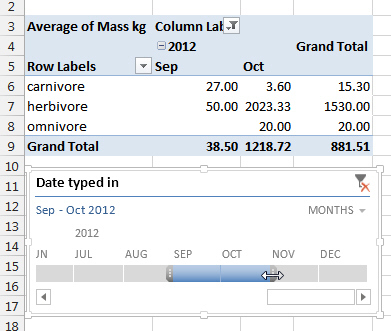 You can see more details on what's new in Power View for Excel 2013 here. PowerPivot Many of the features previously separately available only through the wonderful PowerPivot application are now integrated into Excel. To find out what PowerPivot is, attend our two-day PowerPivot course! If you use Analysis Services, there are also a number of new features, such as the ability to create OLAP measure calculations within Excel and drill-up and drill-down functionality. Having looked at changes to data in Excel 2013, let us turn our attention to charts.